Alexander Bridges bought Avenue House, and one of his descendants, John Henry Bridges, inherited it on the occasion of his marriage in 1879. In its place, he built a new three-storey, red brick structure in the ‘Old English’ style, incorporating parts of the old Avenue House, after which it became known as Ewell Court House. He had some further work carried out later – probably during the early 1890s – including the establishment of several new glasshouses in which to grow all his own produce. 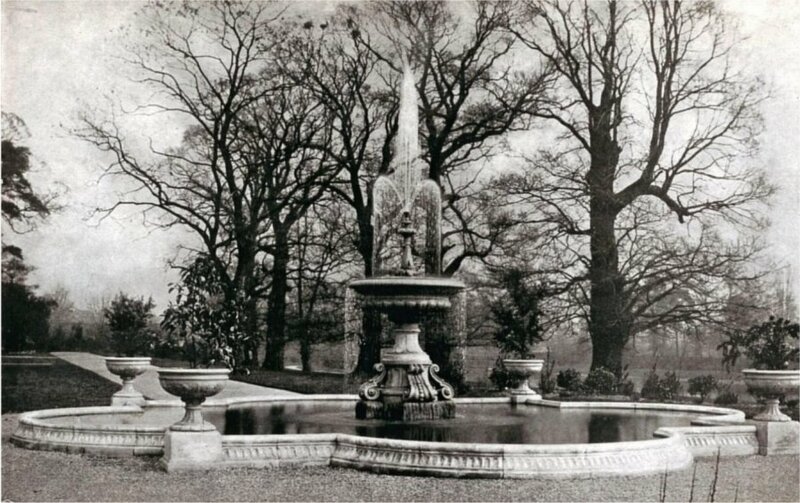 These look similar to others constructed by James Pulham and Son, who are known to have made the large fountain that stood near the house, and the base of which is still there. They also ‘rockified’ the banks of the stream that flowed through the grounds, and created a boating lake – complete with boathouse and island – and cascades. The Ewell Court House Organisation – a local group of enthusiastic volunteers, have worked many long hours bringing this lovely spot back to life. An additional ‘Chapter’ is published each month on this website under the ‘Where? / Site of the Month’ tag, so don’t miss those. Click on the link to see which ones are already available to read. To check out the names of the People and Places featured and illustrated in any of the other Chapters, click the CONTENTS link to return to the main CONTENTS Page, or, to go direct to the ‘Buy The Book’ page, click here. Happy Reading to all our followers. A full description of the work done by James Pulham and Son at Ewell Court House – together with a number of pictures – can be found in Chapter 18 of Rock Landscapes: The Pulham Legacy – the critically-acclaimed and lavishly illustrated definitive story of the lives and work of James Pulham and Son. Written by Claude Hitching, with featured photography by Jenny Lilly. Published by Garden Art Press. Posted on September 5, 2014 June 26, 2016 by Claude HitchingPosted in Book ContentsTagged . . James Pulham and Son, Alexander Bridges, artificial lake, boathouse, Claude Hitching, ewell court house, Ewell Court House Organisation, Ewell Fountain (James Pulham and Son), John Henry Bridges, Rock Lnadscapes: The Pulham Legacy.